Jerrz wine bottle opener manual tool is obviously a champion among corkscrews wine bottle opener. Its functionality enables you to use it as a travel wine opener, beach wine opener, home wine opener and counter wine opener with the same comfort. When other wine openers give up, this wood wine bottle opener remains elegant and attractive. Unlike other wine keys made of thin steel plates, this wine opener stainless steel components have been developed to serve for decades. A blend of load resistant steel and rosewood inlays makes this heavy duty corkscrew a desirable contribution to anyone's collection. This foldable wine opener enables you to open wine effortlessly making a moment more of a ceremony. Jerrz wine opener corkscrew may be easily used as a sommelier professional corkscrew, pocket corkscrew, pouch corkscrew, bartender corkscrew as well as home wine opener corkscrew for the lovers of this fabulous drink. Small sized and well balanced, this wine corkscrew is pretty unnoticeable wherever you put it into. And yes, this wine opener key with its aesthetic appearance and expensive looking box it comes in is a good gift to give whatever the occasion is. Cute wine opener is a must have wine opener tool. To insure the highest functionality the construction of the wine key was simplified and reinforced making it practically unbreakable wine opener. Light weighted at the same time it is a #1 wine key for women and one of the best wine keys for bartenders. The Jerrz corkscrew opener is a multifunctional tool blending the functions of wine cork opener, beer bottle opener and foil cutter. The latest is long enough to be used outdoors instead of a pocket knife if forgotten. It cuts cheese & vegetables as easy as it goes through the toughest wine bottle necks. Small wine key is an indispensible tool during trips, travels, hiking tours or whatever vocation. The size of our portable wine opener makes it ideal to fit almost any pocket or bag section. Jerrz: designed to enjoy! UNIVERSAL Jerrz wine opener is an all-in-one tool: a corkscrew, a bottle opener, and a foil cutter. It's designed for professional bartenders, sommeliers, waiters and wine enthusiasts, regardless of age and gender. 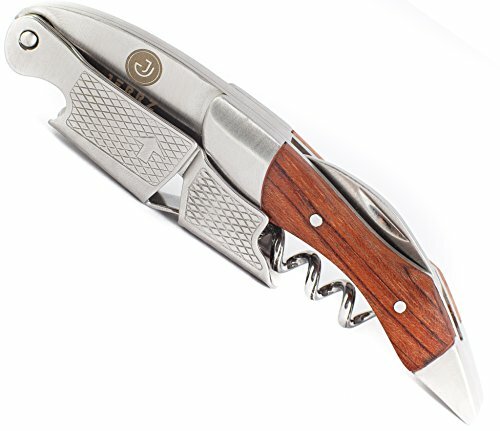 QUALITY wine key is made of durable wear-resistant 420 stainless steel and rosewood, which is much stronger than oak. Designed for extensive use and maximum durability. EASY TO USE corkscrew for wine bottles with double-hinged fulcrum, grooved warm and long curved foil cutter to ensure effortless corks removing. No lubrication before use required. DESIGN. Compact and light, this waiters friend corkscrew with foil cutter is suitable for opening natural and synthetic corks alike. Its aesthetic appearance and gift box it comes with make it an ideal gift or home addition. Now you're always ready to party! UNLIMITED WARRANTY. Great value for the money! If for whatever reason the wine opener does not satisfy you, we will replace it or make a refund. If you have any questions about this product by JERRZ, contact us by completing and submitting the form below. If you are looking for a specif part number, please include it with your message.